Last Saturday I was at a panto which was being directed by a man that I have worked with ever since I was about 6, I also a couple of the principles and chorus. Anyhoo I told them I was going to the show tonight and in one scene the characters were meant to be at school and some one drew on the chalkboard a massive heart with Katie + The Beatles in it, I loved so hard- I got strange looks. Yeah their cover isn't very good but neither were they. It was before they went all Glam, i think it was late 60's but could be wrong. We're listening to Sirius' Deep Tracks channel at work, and they played "Cut Me Some Slack." My main Beatle buddy coworker came out of his office, incredulous, "Did I hear that correctly, they said that was Paul McCartney ?! That was pretty deep and dark." I was a little surprised at *his* surprise; I certainly don't think the song's deeper and darker than "Helter Skelter ." The other day I was walking through the employee entrance with one of my co workers who was just beginning his work shift. He muttered "Back to work Eight Days A Week ". I almost busted out singing "Eight Days A Week ", but I stopped myself. It was 8°C outside today, and in one of my classrooms the teacher had the window open and I told my friend "It's cold, it's a cold place". Of course he didn't catch the reference to Help !, but I knew what I meant. Was out in Glasgow in a cafe/restaurant type place where, in amongst all the hustle, bustle and conversation that goes on, that inner Beatle radar started tingling and after tuning out everything else A Hard Days Night came to the fore. After that it was Happy Xmas (War Is Over); you'd think it was a bit early playing Christmas songs but then its only 337 days to go - surprised shops haven't got their decorations out and cranking out Merry Christmas Everybody every 7 minutes. Hey why not? Stores begin pumping up for Christmas around July. Lets just kick it back a few months and start prepping for Christmas right after the previous (Christmas) season ends. I was on Facebook when I had a notification pop up. It was from the Hard Rock Casino about the Joan Jett concert I am going to. For events such as concerts, one can join the group and add if they are going, not going, etc. This guy, that joined and posted a comment, name is George Harrison . So, in my notification bar its say: "George Harrison posted in Joan Jett & The Blackhearts." Oh well, I don't know anything about Slade. I only know about 2 normal songs which I forgot the name of and then of course that Christmas song. A co-worker suggested I read a trade article on the affects of the 'aging worker' in the workplace. It was titled "When I'm 64". Oh, my. I just did a title search for "When I'm 64" in the Business Source Premier database from Ebsco. 30 articles came up with that as part of the title. Which publication had the article your co-worker suggested you read? "The song was intended as an attempt to write a simple pop song with a melody in the style of The Beatles. Phil Collins acknowledged in subsequent interviews that the song also features one of his attempts at a "Ringo Starr drum part". It still amazes me how through the course of modern music (ie from the 60's onwards) The Beatles and their influence on it keeps on reappearing. 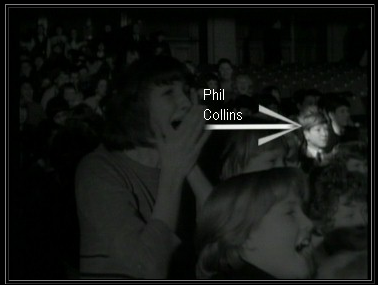 ^^ Wasn't Phil Collins an extra in A Hard Day's Night ? but he wasn't known back then, I find it rather serendipitous. I just had a Beatley Moment on this site. WARNING: The admin postbag contains 909 posts which require removal. Shouldn't you therefore see to the posts instead of telling us how many you might have to fix. Get to work and earn your keep.